The AV32 is definitely one of the better-looking speakers, with a facade that is well-defined yet not too overstated. The tweeters sit within a shallow waveguide that is supposed to help sound dispersion. 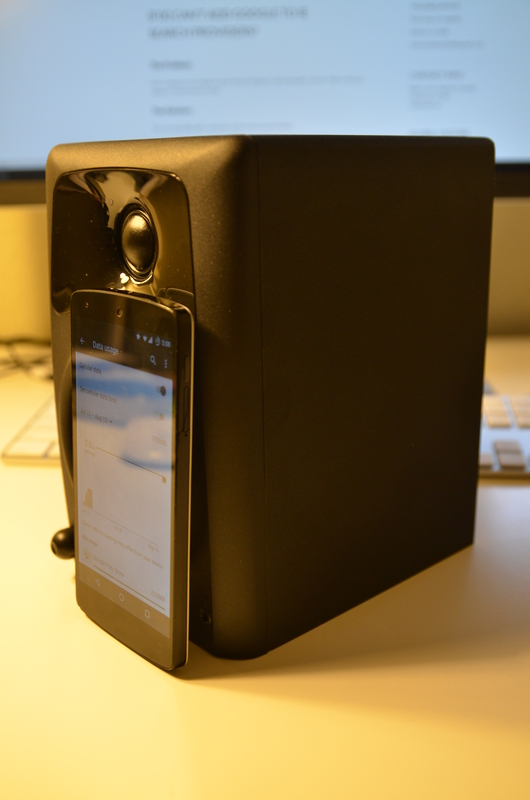 The master speaker’s convenient front ports: an auxiliary port for portable media players and a headphone port. The volume knob is conveniently placed at the front, but the power switch is still at the back. 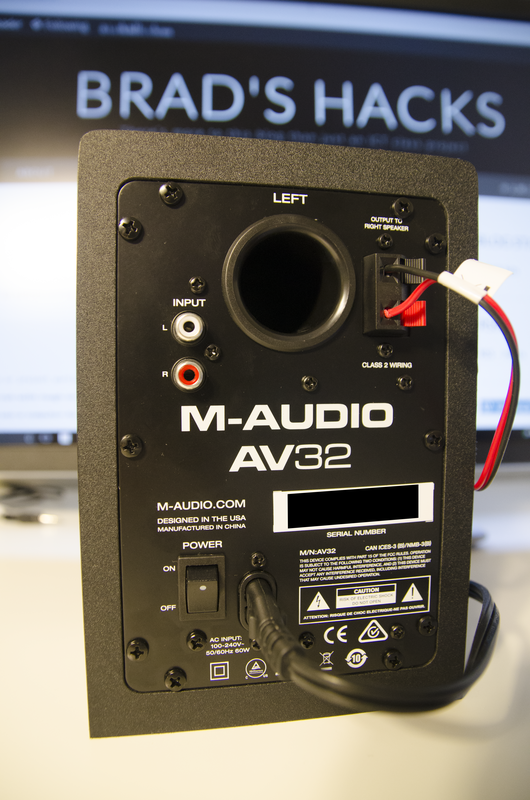 The back of the master speaker: the AV32 is missing the bass boost button from its predecessor, the AV30. 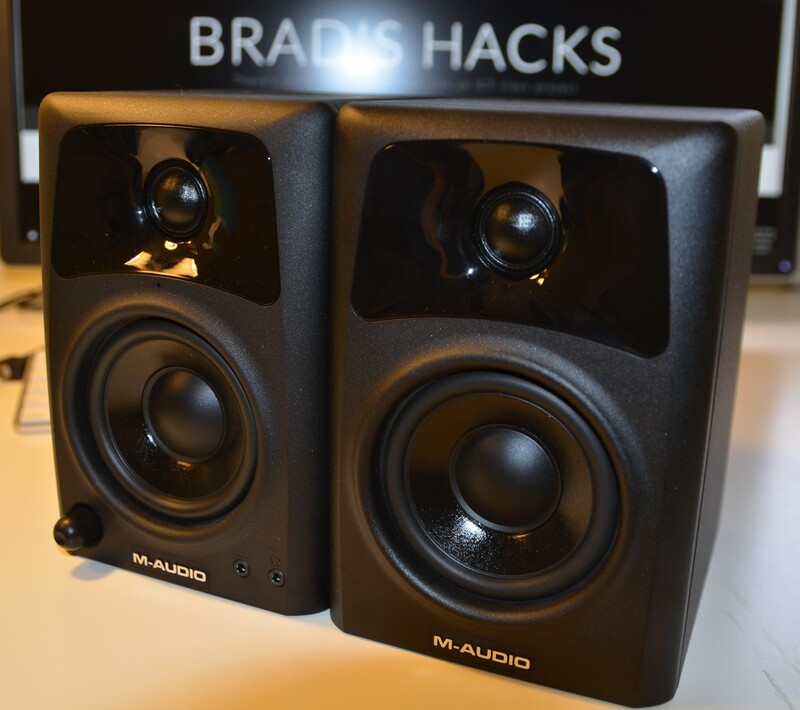 M-Audio labels the AV32 as studio monitors, but really they stand somewhere between studio monitors and computer speakers. At only $7 more than the Logitech Z523, the AV32 immediately rendered the Z523 as absolute rubbish. The Z523 does include a subwoofer, but just because it’s deep and loud bass doesn’t mean it’s good bass. The clarity and detail of the AV32 is so much better than the Z523 that I feel guilty comparing them. The AV32 has very good spatial positioning and projection. Whether it’s Eagles’ “Hotel California” or Mark Ronson’s “Uptown Funk”, I can hear that certain instruments are coming from different places/directions, as opposed to the mushy, clumsy mess the Z523 produces. The bass is quick, punchy, slightly accentuated, but lacks fullness. With a bass roll-off at 80Hz, they can really use the help of a subwoofer. Rock and EDM don’t sound that great on the AV32. The mids sound a bit hollow and the vocals sound a bit dry. 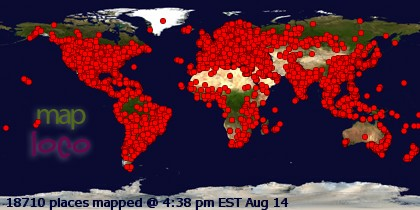 It seems to be adding reverb to everything. The treble is clear with a level of detail that leaves most “computer speakers” in the dust. Soundstage has some dimension to it, which is nice. Imaging is not bad. The Micca MB42X puts the vocals in between the speakers, and other instruments right where the speakers are. The AV32 seems to displace the sound from the speaker boxes themselves a bit more. 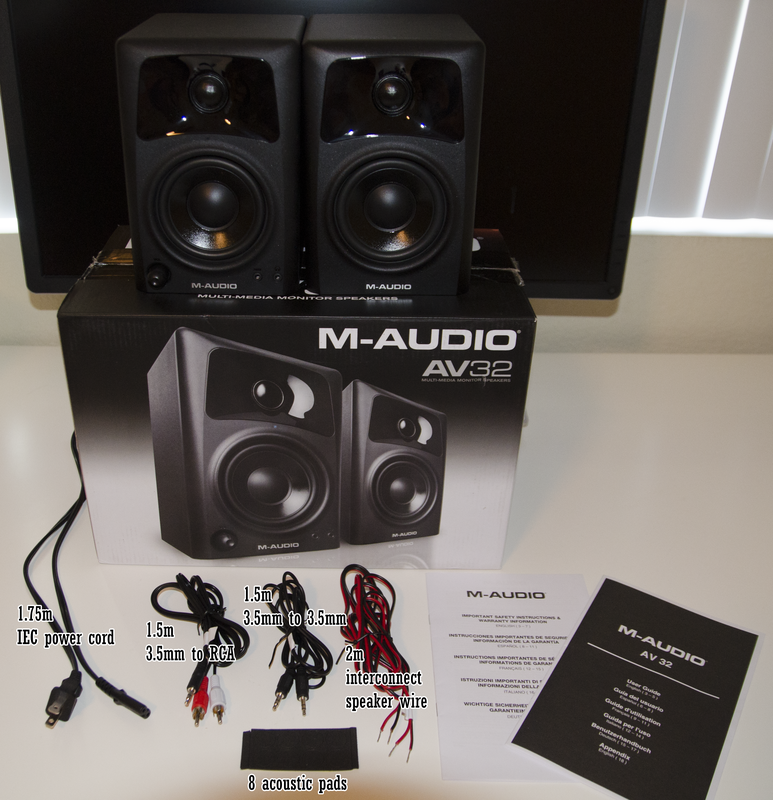 Despite its flaws, the M-Audio AV32 is still a great bargain and a substantial upgrade from any ~$100 computer speakers. However, they have failed to take the crown from the Micca PB42x to become the best ~$100 speakers you can buy. 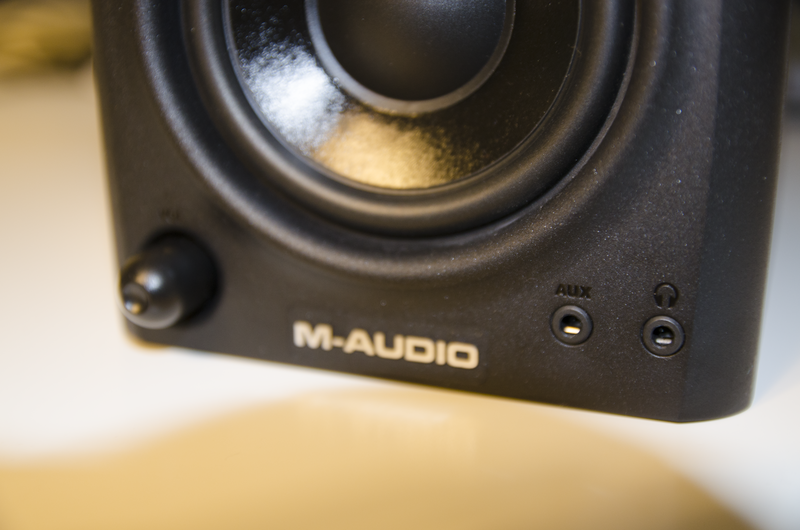 Although the AV32’s soundstage may be a little more accurate (probably thanks to the waveguide), the Micca PB42x sounds more natural and relaxed, have more bass and are louder. However, that doesn’t mean the AV32 are anywhere near bad — so nice try, M-Audio, for trying to reach down into consumer-grade audio products.